I want to say THANKS to all who supported my recent fundraising endeavor with Dr. Ingrid Jordon-Thaden on Experiment.com — we are going to be able to do some much needed fieldwork and conduct fundamental biodiversity research with the money you have all helped us to raise! Thanks so very much, and stay tuned for updates (Lab Notes and Blog Posts) on this ‘open access’ alpine research. 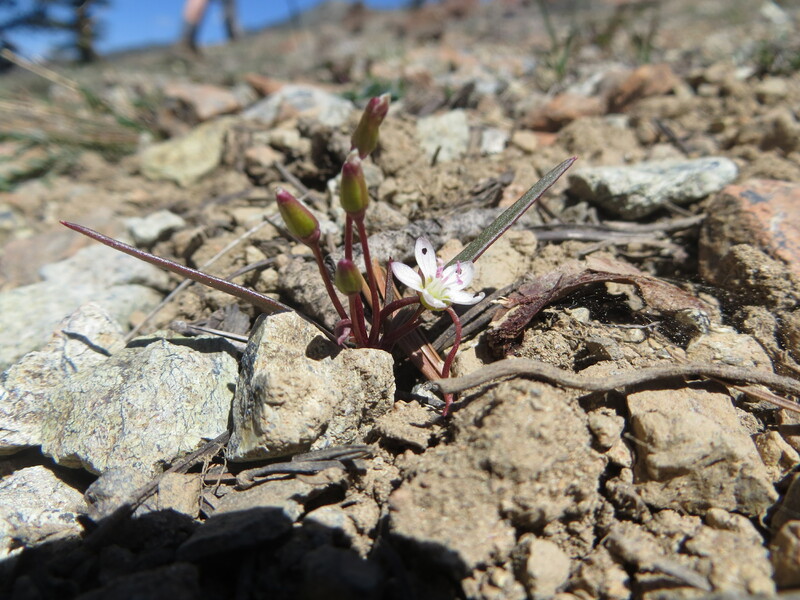 I started the trip by meeting up with Larry Crawford for some botanizing in the Sierra Nevada — we found Claytonia sessilifolia (Torrey) Henshaw(pictured above) flowering profusely near Carson Pass in an area that Larry had previously scouted. This plant was featured in the recent Spring Beauty Pageant hosted on my website — it isn’t too late for you to cast a vote for your favorite(s)! 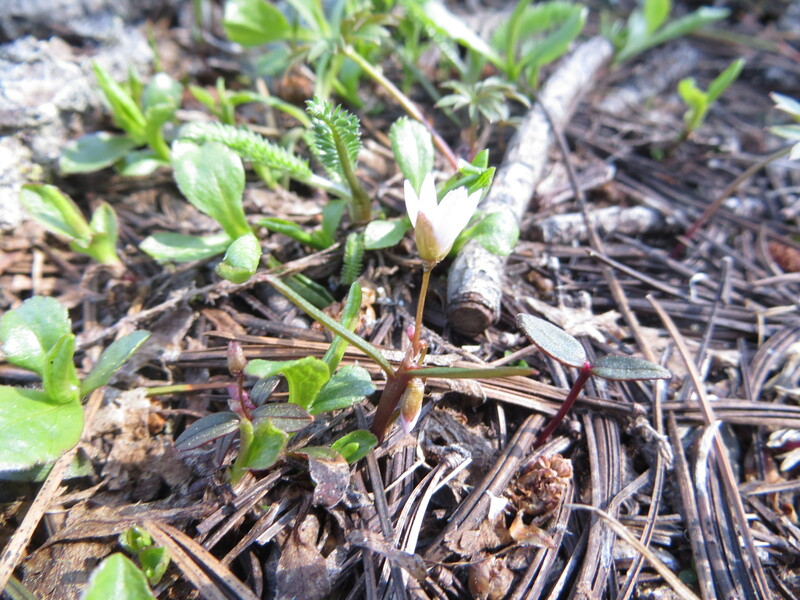 In this population it seems like there is only one species present (C. sessilifolia), but this taxon occurs in an interesting habitat (pictured below, with Diana Jolles and Larry Crawford). 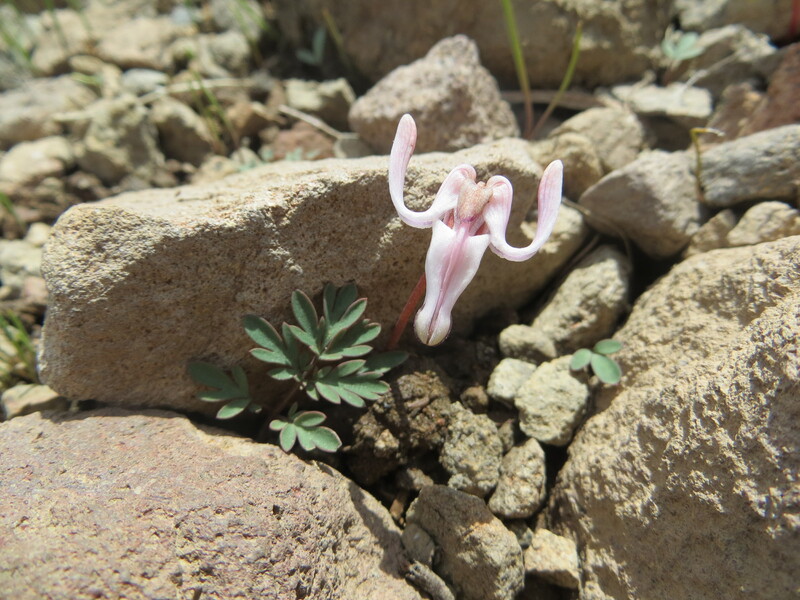 It also occurs next to some other fantastic spring ephemerals, such as Dicentra uniflora (pictured below) — the hike was well worth it! 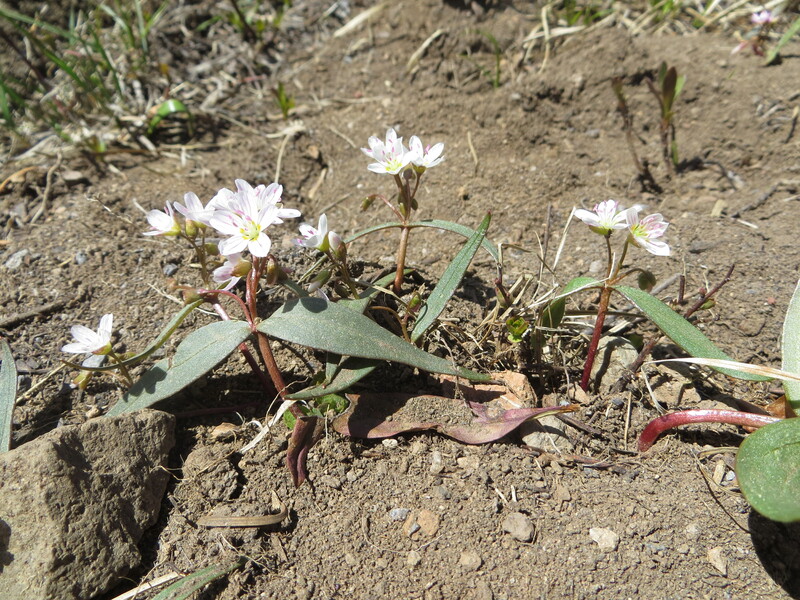 Next was Abbott Butte (west of Crater Lake National Park) — I ABSOLUTELY had to visit that area this year, as it is the type locality for Claytonia obovata Rydberg. 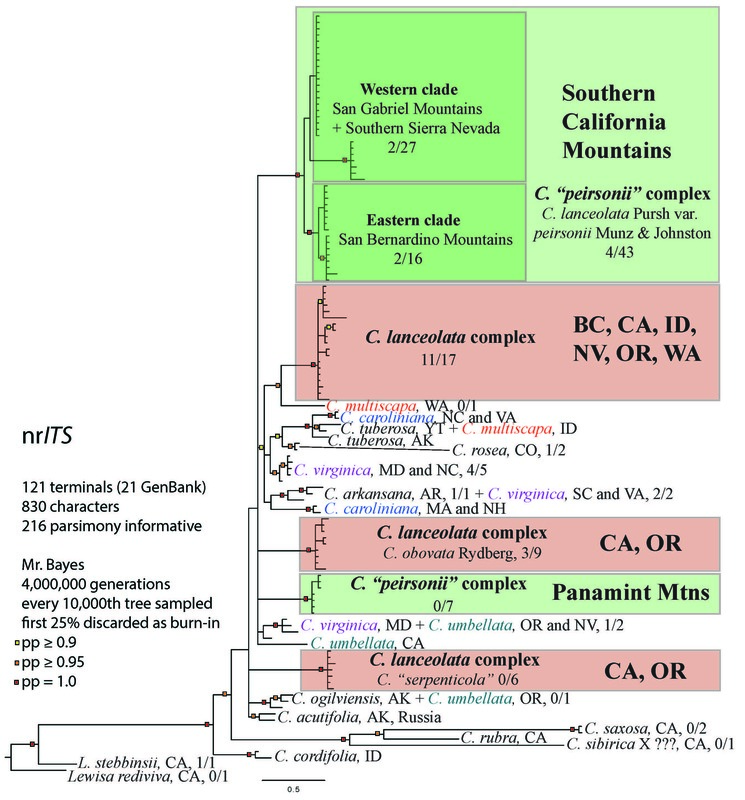 Ray Davis chose to sink this taxon into synonymy in the 1960’s — it has been treated as C. lanceolata since that time. 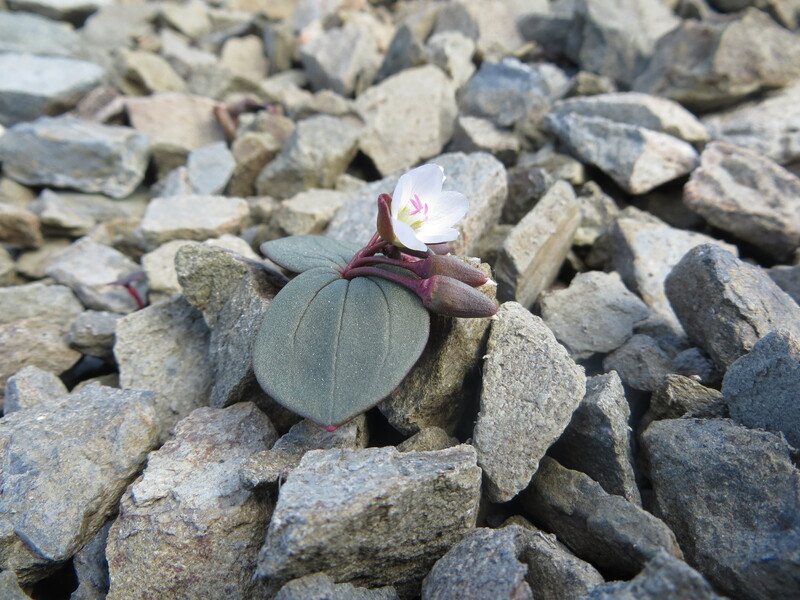 Ray mentioned in his 1966 North American Perennial Species of Claytonia that he collected plants answering the original descriptions of C. obovata, C. multicaulis, and C. chrysantha, as well as C. lanceolata at Abbott Butte. 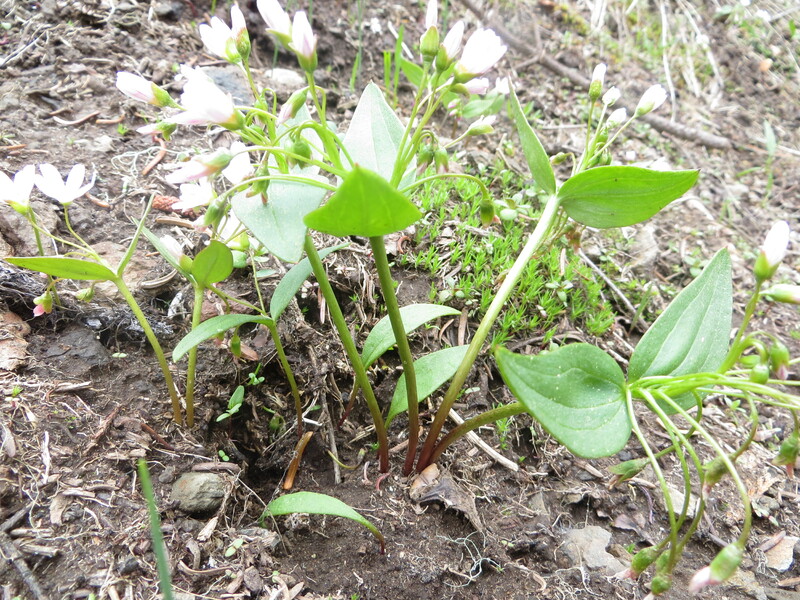 Although he didn’t recognize C. obovata, tubers he collected of that taxon from around the type locality that he grew in a ‘common garden’ retained their rounded leaf shape. What did I find at Abbott Butte? 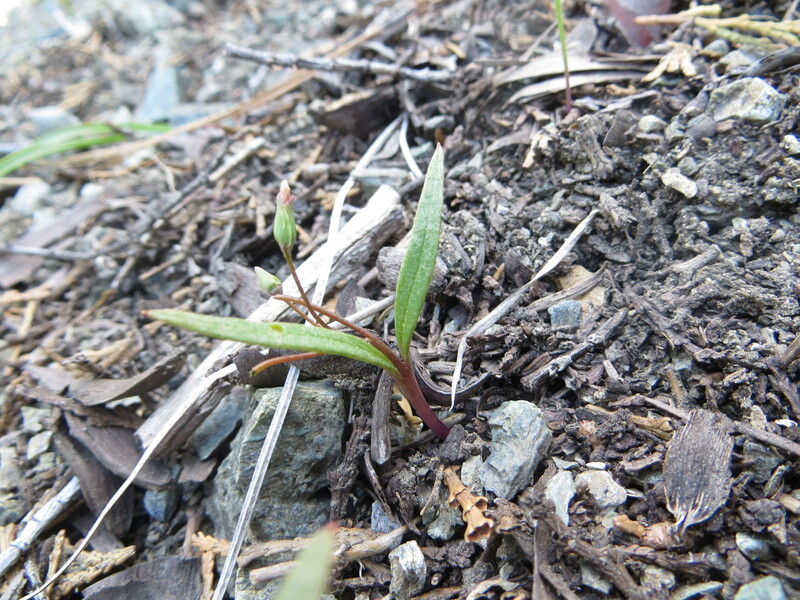 Claytonia lanceolata (pictured below, lacking bifid petals), but not any C. obovata — did it not come up this year? 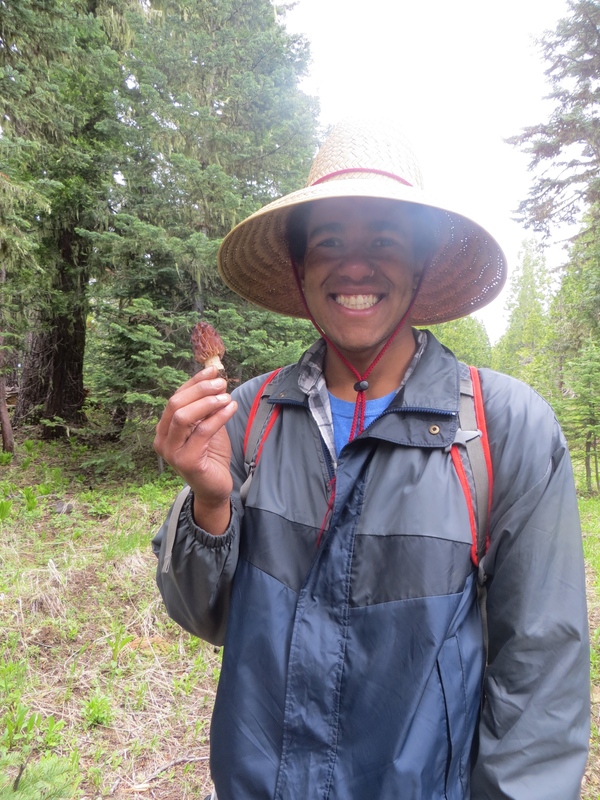 I’ve certainly observed this happening before with C. “peirsonii” in southern California… at least Julian (pictured below) found some delicous black morels (Morchella elata-M. angusticeps-M. conica complex). = YUMMY. 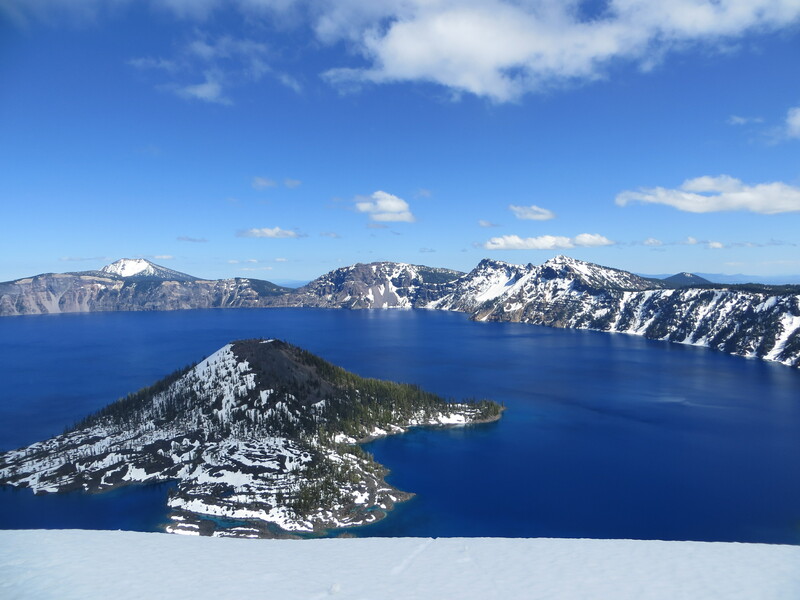 What do you do when you can’t find a species at its type locality? You write a paper about it — look for Stoughton et al. (in prep.) coming to a Madroño near you. 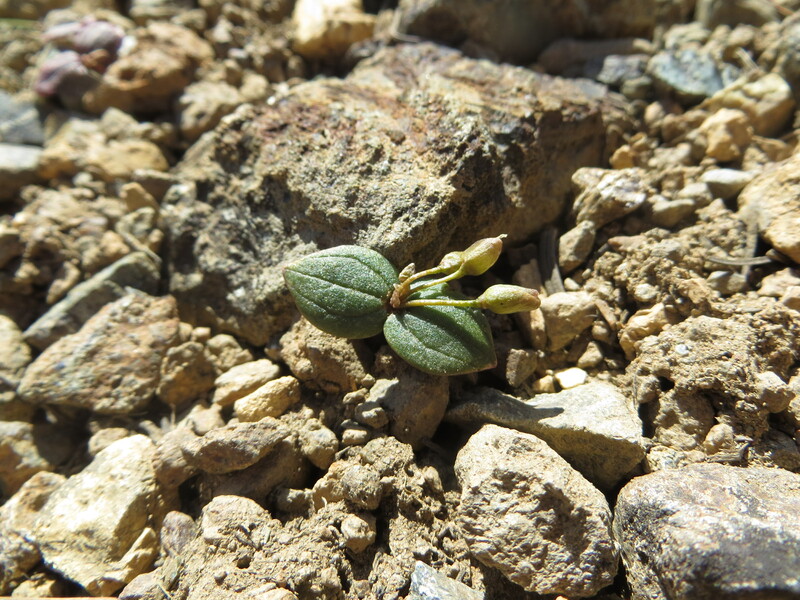 Fortunately, I have seen C. obovata previously with Heath Bartosh at Hull Mountain — this area is also mentioned in the protologue for C. obovata Rydberg. 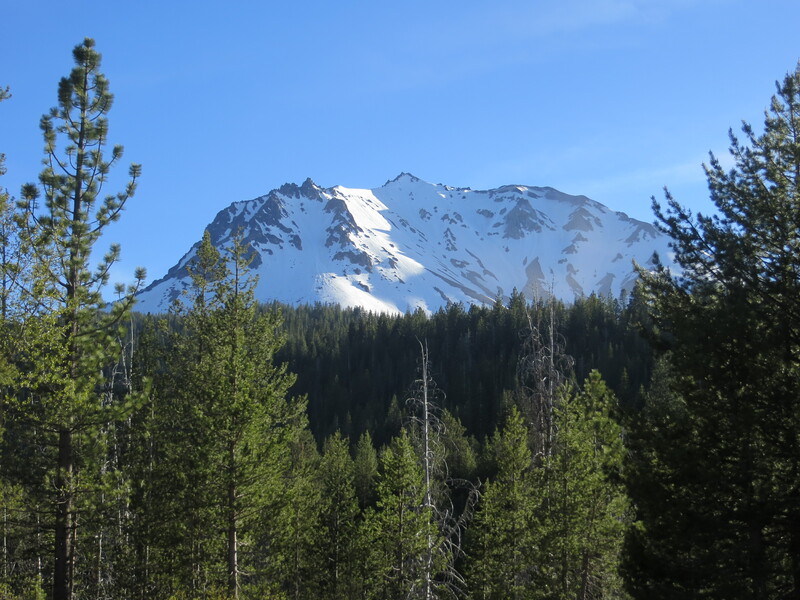 I did find C. obovata with Diana Jolles and Julian Roberts later during our trip near Cory Peak and Mount Eddy on the Shasta-Trinity National Forest in the Klamath Region of California, but I want to tell you first about the next stop on our road trip at the Siskiyou Mountains of southern Oregon — Observation Peak (pictured below) is an area where C. “serpenticola” (pictured below, and at the beginning of this post) is known to occur. 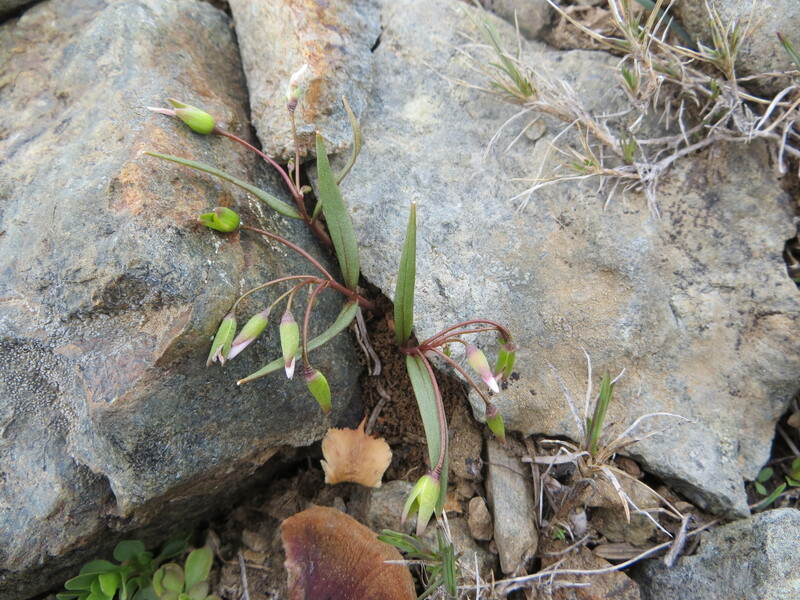 After seeing C. “serpenticola” (pictured above) more or less ‘alone’ in the Siskiyou Mountains of southern Oregon on serpentinite and peridotite, we next saw C. obovata (pictured below) similarly secluded in the Scott Mountains of California near Cory Peak — I now had my search images for a hike that was a major part of the trip. 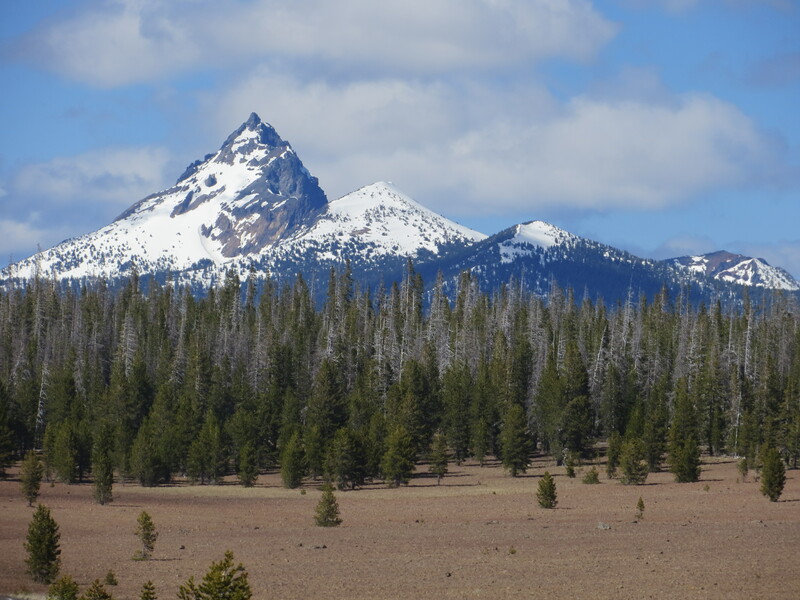 The two species occur in sympatry at Deadfall Lakes just below Mount Eddy, which is where we were headed next. 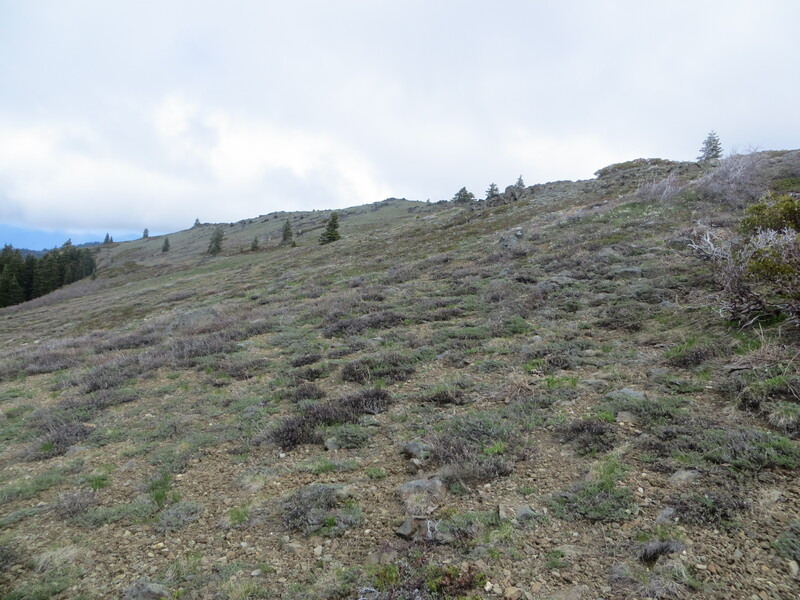 I REALLY want to measure levels of hybridization in this population on Mount Eddy — obvious intermediates exist in the area in seemingly marginal habitats. 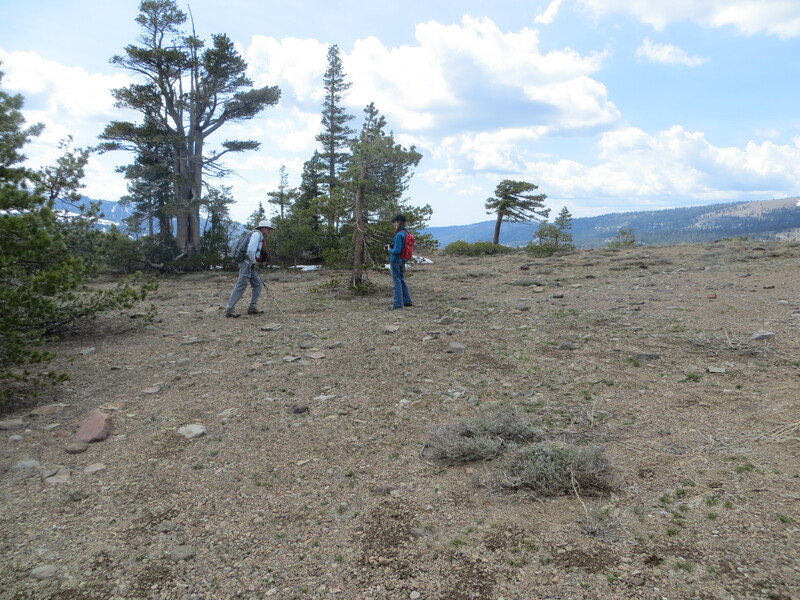 SUCH A COOL SPOT — I will revisit this area next year when there is hopefully a bit better snow pack (which generally = many happy Claytonia). Who is coming with me?! I’m climbing up to the top again for sure. 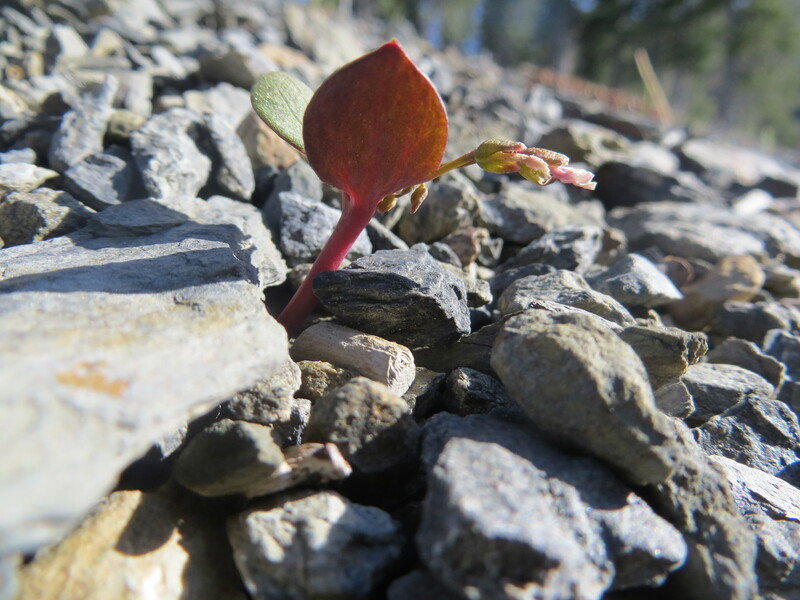 Claytonia “serpenticola” (pictured below) grows very near to the summit, and the view of Mount Shasta (pictured below) from atop Mount Eddy is SPECTACULAR. After poking around Mount Eddy with Dana York and Julie Nelson, and a much needed night of rest (Thanks, Dana and Eva! 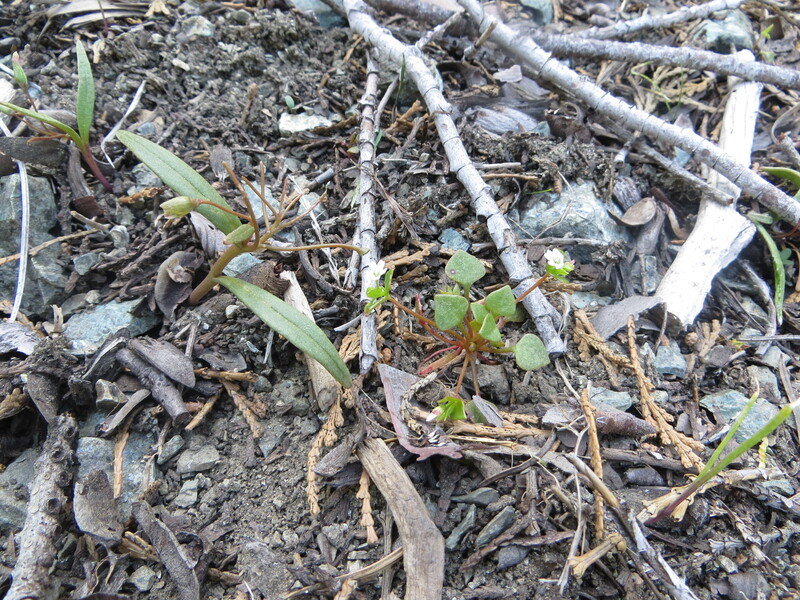 ), Diana and Julian headed with me south to the Lassic Mountain Wilderness (Six Rivers National Forest) and Anthony Peak (Mendocino National Forest) to see C. “serpenticola” (pictured below) and C. obovata (pictured below) at additional areas where they occur in allopatry — plants were pretty crispy in northern California, but they were still identifiable! I am VERY excited to see how things shake out in the molecular phylogeny I am developing for this group… Stay Tuned!!! 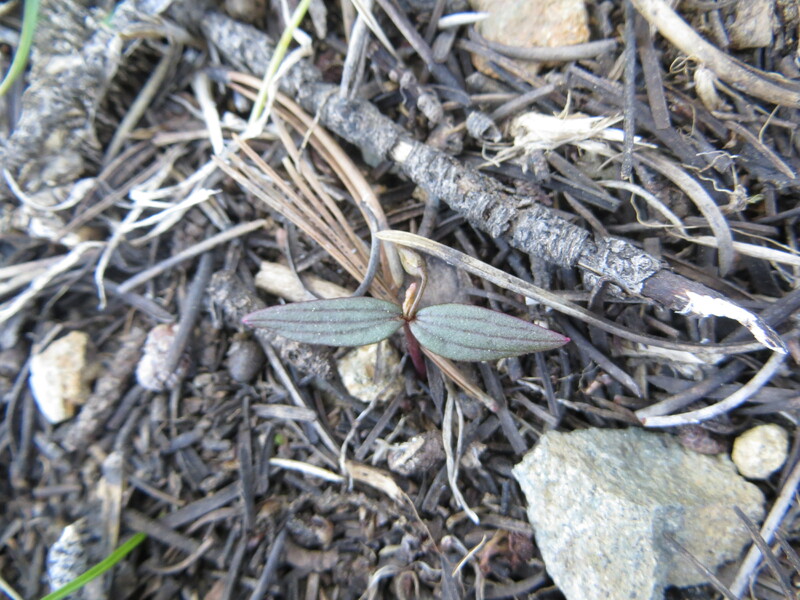 This entry was posted in Claytonia lanceolata species complex and tagged alpine, Biodiversity, california, Carson Pass, Cinder Cone, claytonia, Claytonia lanceolata, Claytonia lanceolata species complex, Claytonia rubra, Claytonia sessilifolia, Cory Peak, Crater Lake, Crater Lake National Park, Deadfall Lakes, Dicentra uniflora, experiment, Geology, hybridization, Klamath Region, Lassen, Lassen Peak, Lassen Volcanic National Park, Limnia, Meiss Ridge, molecular phylogeny, Morchella angusticeps, Morchella conica, Morchella elata, Mount Eddy, Mount Lassen, Mount Shasta, Mount Thielsen, Mountains, Mt. 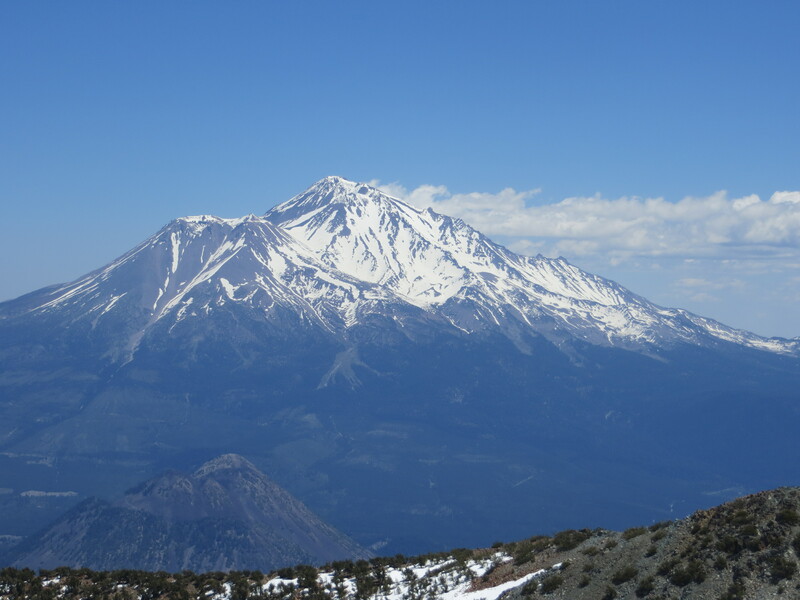 Thielsen, Observation Peak, Oregon, peridotite, Phylogenetics, phylogeny, research, science, Scientific Research, Scott Mountains, serpentine, Shasta, Shasta Mountain, Shield Volcano, Sierra Nevada, Siskiyou Mountains, Snow, southern Oregon, Species, Spring Beauty, Spring ephemerals, Stratovolcano, sympatry, Volcano, wildflowers, Wizard Island by tstou10. Bookmark the permalink. 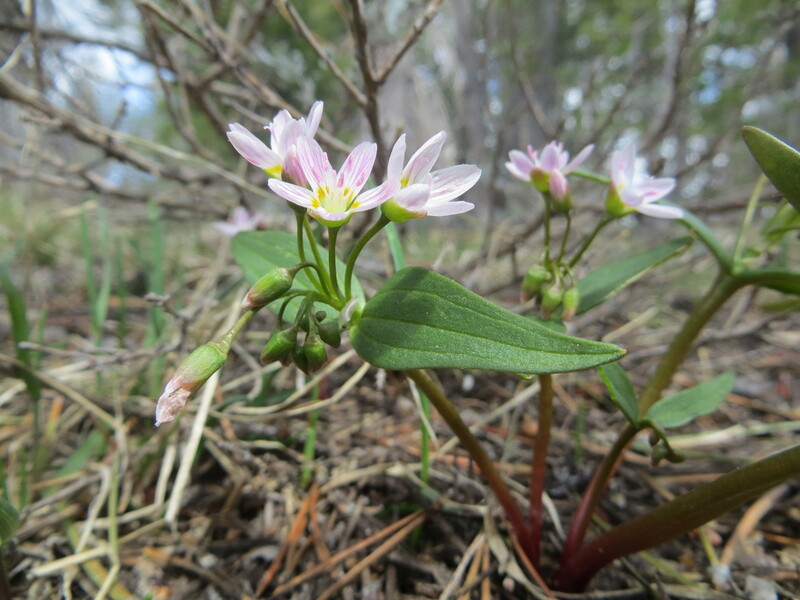 Thanks, Ricardo — They don’t call them spring beauties for nothing!